Madhura Raja teaser: Directed by Vysakh, Madhura Raja stars Mammootty, Jai, Maniyannan, Siddique, Vijayaraghavan, Nedumudi Venu, Salim Kumar and Suraj Venjaramoodu among others. Madhura Raja teaser: Madhura Raja is helmed by Vysakh. The teaser of Madhura Raja released on Wednesday gives us a glimpse of what to expect from the upcoming Mammootty-starrer. After delivering sensitive and nuanced performances in his last two films – Peranbu and Yatra, Mammootty is returning with an unapologetic commercial entertainer. Going by the teaser, director Vysakh seems to have whipped up an over-the-top masala film that could give the 90s Rajinikanth films a run for their money. Even the teaser opens with a background score blaring ‘Thalaivaa’, a term which is used for Superstar Rajinikanth. And then, a couple of build-up shots later, Mammootty enters the screen screaming at the top of his lungs like a quintessential hero of the past era, who has machismo written all over him. 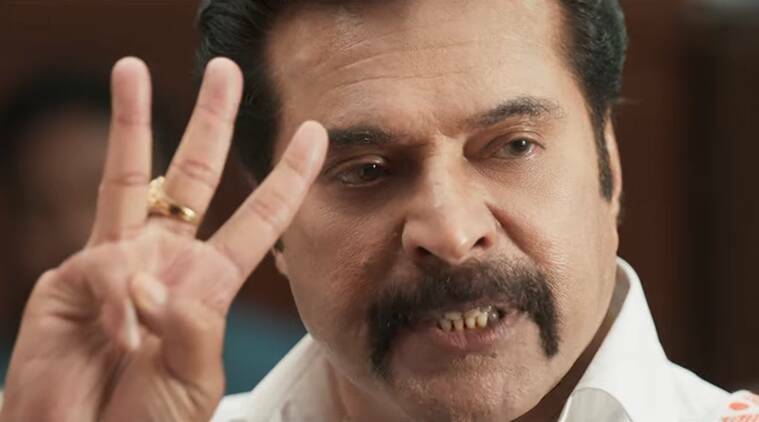 After sending his rivals flying in the air with a single punch, Mammootty resorts to delivering the closing punchline: “…even children will tell you that Raja and his men are always strong. Not double stong. Triple strong (echos three times).” But, Mammootty delivers the line with such conviction and confidence that you tend to forget that the dialogue doesn’t make much sense. Madhura Raja is the sequel to 2010 film Pokkiri Raja, which was Vysakh’s directorial debut. The movie was one of the top-grossing films in Malayalam that year. The upcoming movie is being made on a huge budget and it will simultaneously release in Malayalam, Tamil and Telugu. The post-production work on the film is going on and the filmmakers have announced that it will open in cinemas for Vishu. The film also stars Jai, Maniyannan, Siddique, Vijayaraghavan, Nedumudi Venu, Salim Kumar and Suraj Venjaramoodu among others.